The situation at one of the oldest sites of human civilizations – the Narmada valley of Madhya Pradesh – is today worse than a battlefield where the humble, hard working farmers, fisher folk, potters and labourers are struggling day in and day out to simply survive against the onslaught of the Sardar Sarovar Dam in the Narmada river in Gujarat. They have resisted the dam for the last 32 years which was to drown their lands. Even then, they fought to get their due rehabilitation and compensation that was denied to them. Today, they are pushed to the brink of a crisis that seems difficult to tackle. According to Supreme Court, finalization of dam could be undertaken only after completion of all rehabilitation and compensation work among the Dam Affected People. The Supreme Court did give a deadline of 31 July. The Governments of Gujarat and Madhya Pradesh in cohorts with the Central government have unilaterally taken the decision to close the gates of the dam well before rehabilitation work is completed, or even the court deadline has been met. It is said that the decision to forcibly close the dam gates is another BJP tactics keeping the upcoming Gujarat elections in mind. Completely corrupt practices are underway in the Narmada valley in the name of rehabilitation and compensation. Even after the momentous findings of the Jha Commission that pointed out huge irregularities in compensation money, the elected governments completely swept the report of the commission under the rug. People who lost out due to corruption still await justice. The present trend is ‘secretive’ administrative visits and giving clean chit to every incomplete work of rehabilitation and compensation. Every day engineers or patwaris are conducting random surveys and changing the affected person’s lists on whim. People in the submergence area don’t even know if their name is still on the list or not even if they live in the submergence areas. The entire Narmada valley is rife with such cases where people specially poor and landless find no mention in the lists and have nowhere to go. Tens of thousands of people are still inhabiting the submergence zone as they have not got compensation or rehabilitation. Even those who have received paltry compensation are not enough to survive. Rehabilitation sites are marked by extreme government apathy. In some places there is no clean drinking water. The entire state and machinery of Madhya Pradesh is more interested forcible eviction of people than to cooperate with the citizens of this country whose rights are undermined. Administrative officials and police are busier trying to cover up the stains their political masters have created. 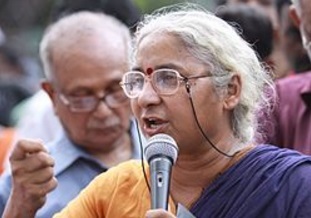 In order to curb the emerging dissent, the government of Madhya Pradesh has enacted the Rajya Suraksha Kanun (RASUKA) (Gazette Notification 25 May) on the lines of National Security Act to declare any protest illegal which means complete suspension of human rights in a place which is hit by a man-made disaster (submergence due the dam). These people have not received their due and are not ready to leave their lands, homes, cattle, community centers, their entire life is at stake. 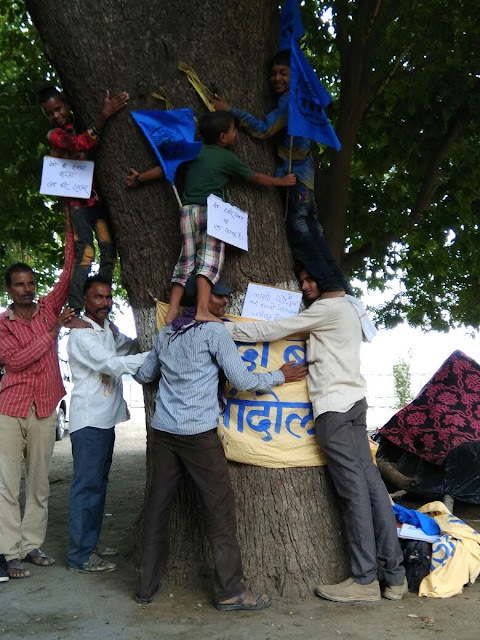 Narmada Bachao Andolan, at the forefront of the struggle of the farmers, farm labourers, fisher folk, potters, adivasis and women of the Narmada valley calls out to all democratic forces of the country and outside to raise their voice against the illegal injustice against a river, a valley and its people. As believers of non-violence, we rest our hope on the Constitution and collective will of the people of India who have earlier gained Independence through satyagraha to come together once again.